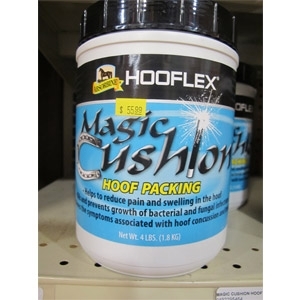 Hooflex Magic Cushion™ hoof packing helps support hooves in several ways including relieving sole bruising and post-trimming soreness, treating abscesses, and fighting bacterial and fungal infections in the hoof. It can be used as needed, or packed under a shoe and pad and left in place through the shoeing cycle. 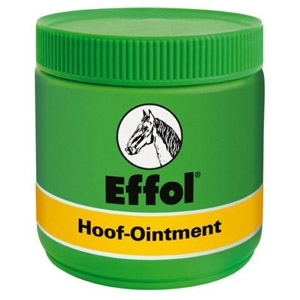 The Effol Hoof Ointment Green ensures healthy hoof growth and also has a disinfecting effect. Daily use guarantees an end to brittle hooves! 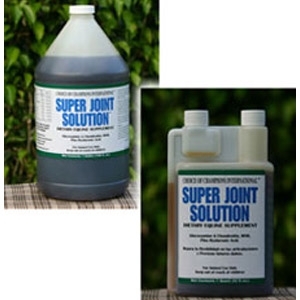 Super Joint Solution is a unique liquid that establishes a serum level in the horses system. 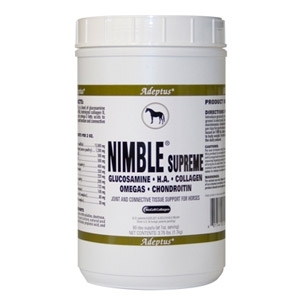 This combination of ingredients will help repair damaged cartilage tissue and maintain the matrix of bone, thus preventing further damage. 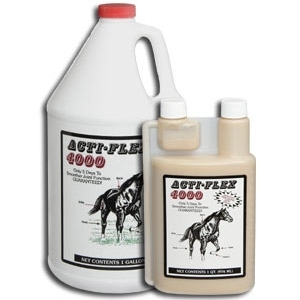 Key substances in Acti-Flex 4000 work together to improve performance by increasing the horse's supply of joint-lubricating synovial fluid, which repairs and strengthens body parts that running puts under high stress. Glucosamine Sulfate, Chondroitin Sulfate, Methylsulfonylmethane (MSM), and Superoxide Dismutase occur naturally in the body, serving the function of repairing joints and many other tissues. Summer Games is a unique blend of both electrolytes and trace minerals specifically formulated to replenish critical electrolytes in the proper ratios. 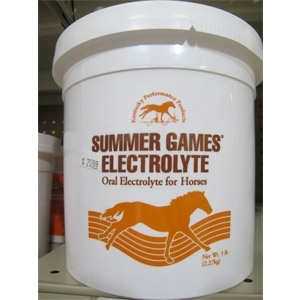 Summer Games supports healthy electrolyte balance so horses stay hydrated, perform at optimal levels, and recover faster after exercise or in stressful situations. 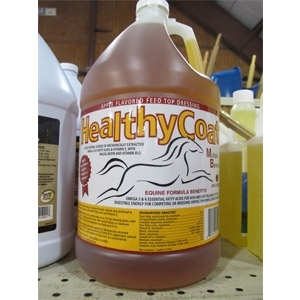 HealthyCoat® is the highest quality all-natural supplement comprised of mechanically extracted Omega 3,6 and 9 essential fatty acids used to promote horse health and increase performance. Just add two ounces HealthyCoat® to your horses feed daily to promote a beautifully conditioned hair coat. Your horses start to look better and feel better in just three weeks or less! 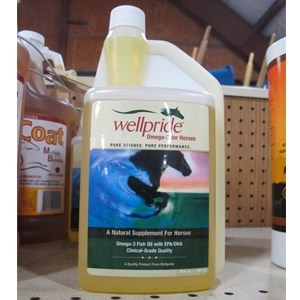 Wellpride is the first scientifically based, omega-3 fish oil with natural EPA-DHA for horses. This high potency, clinical grade formula is backed by research from the world leading universities. The positive health benefits of EPA/DHA have been proven scientifically in numerous field trials. 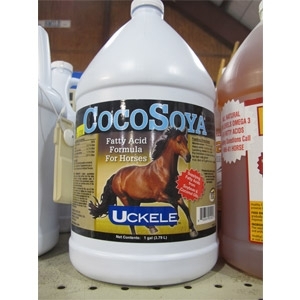 CocoSoya is a blend of highly digestible unrefined soybean oil and coconut oil selected for natural fatty acid balance. It is a natural source of Omega 3, Omega 6 & Omega 9 fatty acids. 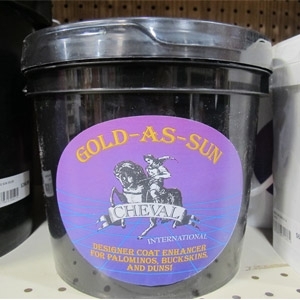 Gold as Sun is a coat conditioner specifically created to bring out rich golden/bronzen highlights and shiny coats on Palominos, Duns, Buckskins and Chestnuts. Gold as Sun is made with oils, spices, herbs and seaweeds. Cheval International. Equinyl™ Glucosamine may help ease inflammation associated with training and competition without causing gastrointestinal side effects. Patented ComfortX™ ingredient may reduce inflammation associated with training and competition, provides joint health support, increases flexibility and shortens recovery time by reducing the emigration of neutrophils to the site of the inflammation. 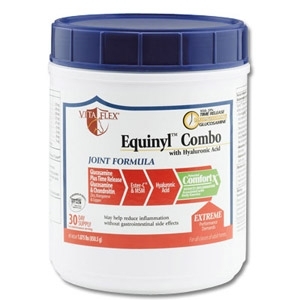 Equinyl™ Combo may help inflammation associated with training and competition without causing gastrointestinal side effects. Patented ComfortX™ ingredient may reduce inflammation associated with training and competition, provides joint health support, increases flexibility and shortens recovery time by reducing the emigration of neutrophils to the site of the inflammation. The ultimate joint & tendon/ligament support formula with effective levels of glucosamine, triple patented hydrolyzed collagen containing molecularly optimized bioavailable hyaluronic acid & chondroitin sulfate, plus omega-3 fatty acids, vitamin C & chelated zinc, copper & manganese, all in a palatable yeast base. (One oz. per day for maintenance.) Available in 3.75 lb. buckets. 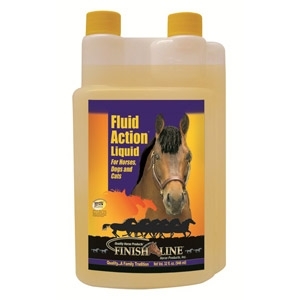 Fluid Action® helps promote healthy joints in your horse and doesn't contain any pain masking ingredients. Pain is nature’s way of saying that something is wrong; give your horse the benefit of natural ingredients and not just temporary pain relief. Available in 1 quart and 1 gallon jugs. Fluid Action® HA provides the same great benefits as original Fluid Action® except with added Sodium Hyaluronate (HA) for extra support in preserving healthy joints. Sodium Hyaluronate, or Hyaluronic Acid supports healthy joint function by lubricating joints and helping to maintain structural integrity. It also increases the viscosity level of the synovial fluid in joints. 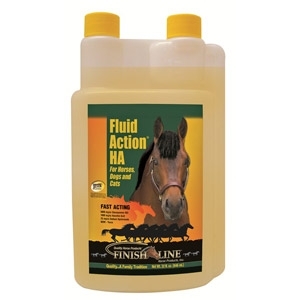 Fluid Action® HA contains Glucosamine, Yucca, MSM, Vitamin C, and many other beneficial ingredients. 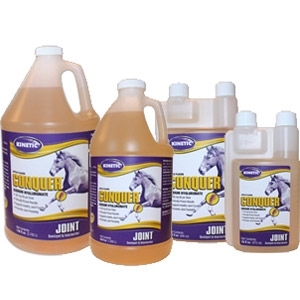 Super Joint Solution is a unique liquid equine supplement that establishes a serum level in the horse’s system. 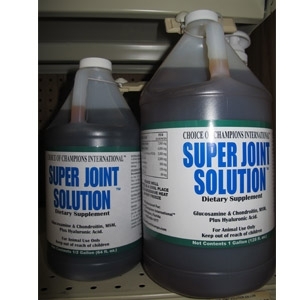 As a daily top feed, Super Joint Solution will restore elasticity to stiff joints and aid in the reduction of swelling and pain associated with Degenerative Joint Disease. Available in 1 quart and 1 gallon jugs. Researchers continue to produce exciting discoveries regarding the lubrication and repair of joints and connective tissue. 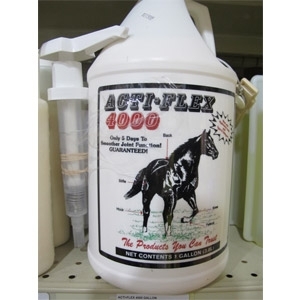 In Acti-Flex 4000, we have put together the most advanced formula yet. It works with remarkable speed, making notable improvement within 5 days. In fact, you might see positive results in as little as 48 hours! Available in 1 quart and 1 gallon jugs. G.O. BIGTM from Peak Performance Nutrients is the only equine supplement specifically designed to promote long term, lean muscle mass on exercised horses. G.O. 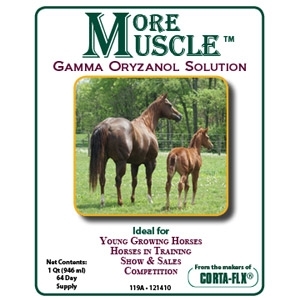 BIG is not a high calorie, high fat supplement to simply "Bulk Up" horses or is it a Gamma Oryzanol only product that may provide a temporary muscle "pump" without any truly long term muscle gains. 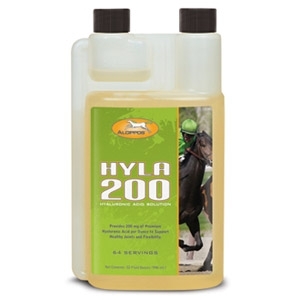 Hyla 200 is a concentrated Hylauronic Solution for Healthy Joints and Flexibilty that provides 200 mg per ounce of high molecular weight Sodium Hyaluronate. H.A. is the key element in synovial fluid that prevents friction in the joint capsule. Hyla 200, with a highly palatable apple flavor. More defined muscles don’t just look good, they’re essential to help your horse achieve its maximum potential performance. More Muscle® supports the normal cardiovascular, immune, and neurological functions of your horse and helps support normal physical and mental performance. For use in horses only. 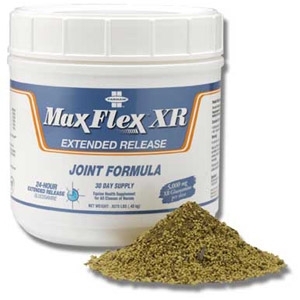 Recommended to support healthy joint function. At 100 mg per dose (200 mg per ounce), Conquer® Liquid is developed specifically to help maintain the health of your animal's joints. Scientifically formulated to provide 24 hour joint care. 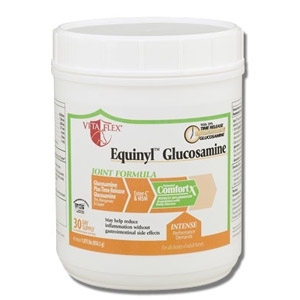 One daily dose keeps glucosamine in your horse's system a full 24 hours, over 24 times longer than other joint supplements. Extended release glucosamine releases slowly over time, providing a constant supply of available glucosamine to the joints. 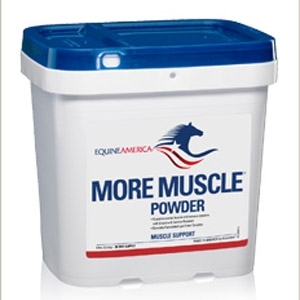 Look no further than MORE MUSCLE™ Solution when MORE MUSCLE™ is needed on your sales, show and performance horses. 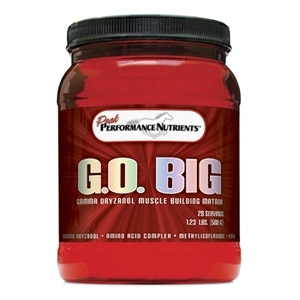 Each 1/2-oz measure contains a whopping 1000-mg of pure gamma oryzanol. 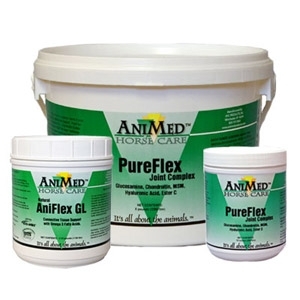 AniMed® PureFlex Joint Complex is a superior blend of Glucosamine HCL, Chondroitin Sulfate, Hyaluronic Acid and MSM. 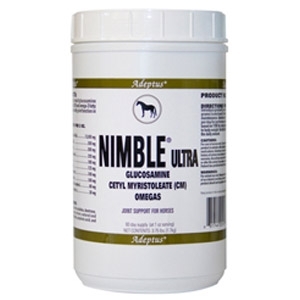 Recommended for horses with osteoarthritis, aging horses and all horses facing the day-to-day joint stress of athletic training, performance and competition.